If you watch Law and Order or any of the CSI shows, you probably think you have a good idea of what it is like to serve as an expert scientific witness in a courtroom trial. But how accurate are those shows? What is it really like to serve as an expert witness in a science or technology case? How does one prepare? What sorts of questions can you anticipate? And, how does one even go about becoming an expert witness? 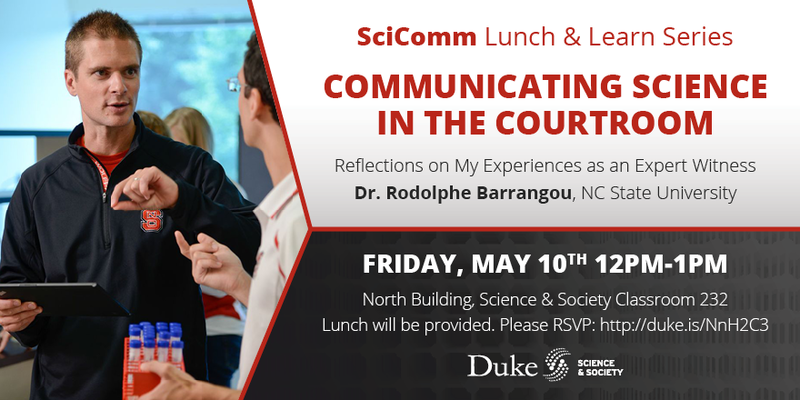 In our May installment of the SciComm Lunch-and-Learn series, Dr. Rodolphe Barrangou (a CRISPR expert from NC State University) will answer your questions and share some surprising stories from his many experiences as an expert scientific witness. This will be the last SciComm Lunch-and-Learn before summer break and it promises to be a fascinating and entertaining discussion, so don’t miss it or you’ll be held in contempt. Dr. Rodolphe Barrangou, is the Todd R. Klaenhammer Distinguished Scholar in Probiotics Research in the Department of Food, Bioprocessing and Nutrition Sciences at North Carolina State University, and Editor-in-Chief of The CRISPR Journal. He is widely acknowledged as one of the world’s experts in CRISPR technology, and was first author on the 2007 Science paper providing experimental proof for the immune function of CRISPR. He has also served as an expert witness in numerous legal cases focusing on science and technology. Can’t attend in person? We will be live streaming the event on our YouTube channel. We will be providing lunch for all attendees, so please RSVP, join us and expand your scicomm toolkit!